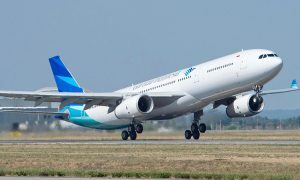 The long-haul, twin-aisle airplane is the first of 10 777-300ERs delivered to the airline and is a key component of the Garuda Indonesia’s Quantum Leap fleet revitalization program. 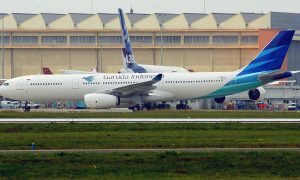 The airline configured its new 777-300ERs with eight first-class suites, 38 business-class seats and 268 seats in economy class. 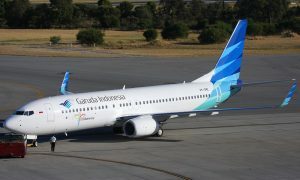 The aircraft is also equipped with in-flight internet connectivity. The Boeing 777 is the world’s most successful twin-engine, long-haul airplane. The 777-300ER extends the 777 family’s span of capabilities, bringing twin-engine efficiency and reliability to the long-range market. The airplane can fly up to 7,825 nautical miles (14,490 km). The 777-300ERs are equipped with GE90-115B engines, the world’s most powerful commercial jet engine.